Another snowy morning yesterday, another warming breakfast. 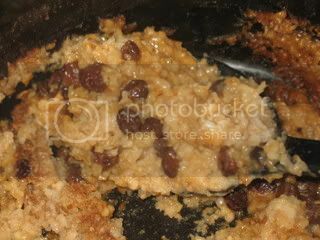 Steel cut oats cooked overnight in a crockpot with brown sugar, cinnamon, vanilla, & dried fruit results in a creamy, tender oatmeal...no crunchiness left at all! So delicious...you must eat this soon! Spray crockpot with nonstick cooking spray. If you're planning to cook the oatmeal 8 hours or longer, use 4 cups of water. If you want to cook it less than 8 hours, use 3 cups of water. Put all ingredients except nuts in slow cooker, cover, and cook on low overnight. Just before serving, stir in walnuts & a splash of milk (if desired). Of course, you could add any flavorings or fruits you wanted to. Fresh chopped apples would be good, as would dried blueberries or apricots...maybe some coconut. And you could top a bowl with sliced bananas, a drizzle of honey or maple syrup...the possibilities are endless! This looks amazing (as usual). I need to take insulin just looking at it!!! my aunt is obsessed wtih crok pot oatmeal and has been telling me to make it for years! i think youve inpsired me to officially do it!